I got excited when the yearly reminder to sign up for October’s NY Comic Con appeared in my inbox. For years, I swore I’d love to attend but life always interfered somehow: had to work and couldn’t get off, or something was up with the kid, or after all the bills got paid, the till’s empty and so were my pockets. This year, however, was different. The stars aligned in my favor. For once. Upon receiving the notice I needed to fill in my fan verification form, a method of preregistration, I counted the days until the site opened. As one can imagine, in years past, tickets to this event were hotter than asphalt in Florida on an August afternoon, and acquiring them often required a Ferengi’s ability to pilfer, smuggle and trade. So who can blame the folks at NYCC to try a new method of ticket selling so that anyone who wanted to attend actually could…legitimately? Once the Fan Verification site went live, I filled in my name, my husband’s name and my son’s. It asked for email addresses. Since I was treating the family for tickets, I put my own email in all three. I’ve purchased tickets for various and sundry trade shows in the same manner, so why should this be any different? Several days later, I received a notice that tickets were now open for sale for verified fans. After waiting in an electronic queue for well over an hour (lucky I hit the button right as it came live! ), I purchased three tickets and was instructed that I’d need to go to another site to complete the sale. I got excited. Not only was my family going, I planned to surprise my son with his ticket, since the event takes place right before his birthday. As I opened the site’s page to complete the sale, I noticed my email address went in on my designated field, but not on my husband’s or son’s. Strange, I thought, and went to read up on what I might be doing wrong. As it turned out, each person needs his or her own email address. What? Aren’t I buying the tickets? How come? From NYCC’s twitter feed, I quickly learned that many boyfriends, girlfriends, uncles, aunts and cosplay girls and boys believed as I did. Suddenly, we were all shut out of living our dream. No 2016 NY ComicCon for us. I called. The helpful and polite person on the other end verified what in my heart I realized was true: every ticket needs its own email address. If not, we’re very sorry, but we have to refund your money. First, I wanted to cry. Then kick myself for not following directions the way I should. Enthusiasm and past Javitz Center purchasing experiences clouded my decision-making for this event. I hated myself for not following the directions carefully, but then again, why shouldn’t one person be able to buy a couple of tickets? It comes down to a factor more than just hoping to surprise someone with a nice treat: fraud. This convention is so rife with people elbowing out the legit crowd with overpriced scalped tickets, the powers that be decided to try another way. Unfortunately, there were an awful lot of people like me, and all of us, including me, let NY ComicCon folks know how devastated we all were. All we wanted was a good time, fanning it up with our ilk, grabbing autographs and a pile of merch to take home and savor. Out of the blue, I received a nice, polite email from NY ComicCon. Apparently, they heard us. Chose to do the right thing. Gave us a second chance. We had a brief window to verify the fans we wanted to purchase tickets for, only 24 hours, but that was more than enough time. I scrambled online and fan verified both my husband and kid. Twenty-four hours after that, I purchased tickets for all three of us. My heartbreak turned out to be a ticket to heaven. Now we’re all going! 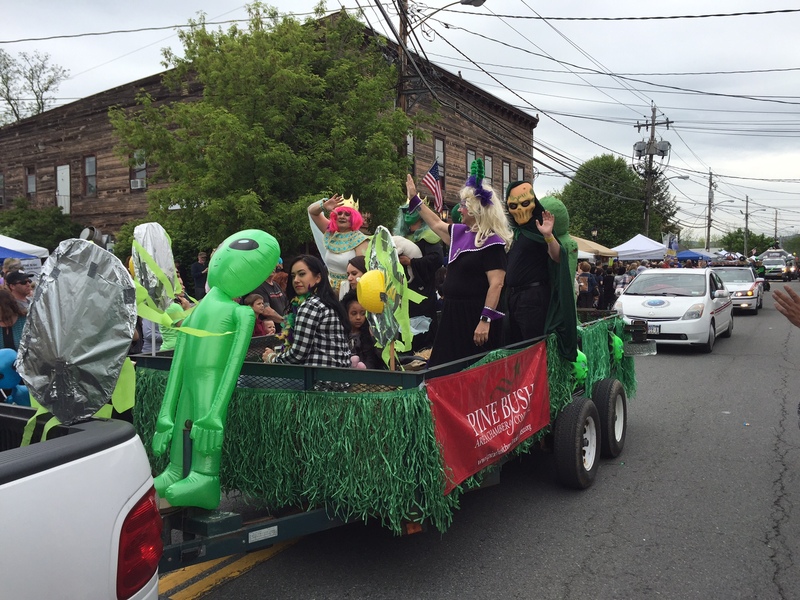 Pine Bush, NY Alien Festival is a local institution celebrating that town’s rather long legacy as the Hudson Valley’s premier UFO visitation site. 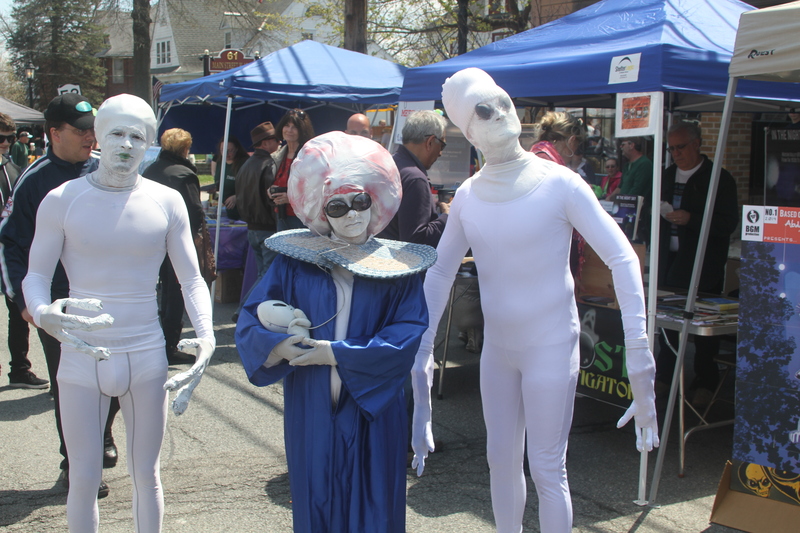 And while it might not compare with, let’s say, ComicCon, it’s a small, charming, earnest festival that welcomes aliens and their friends from all over the universe. 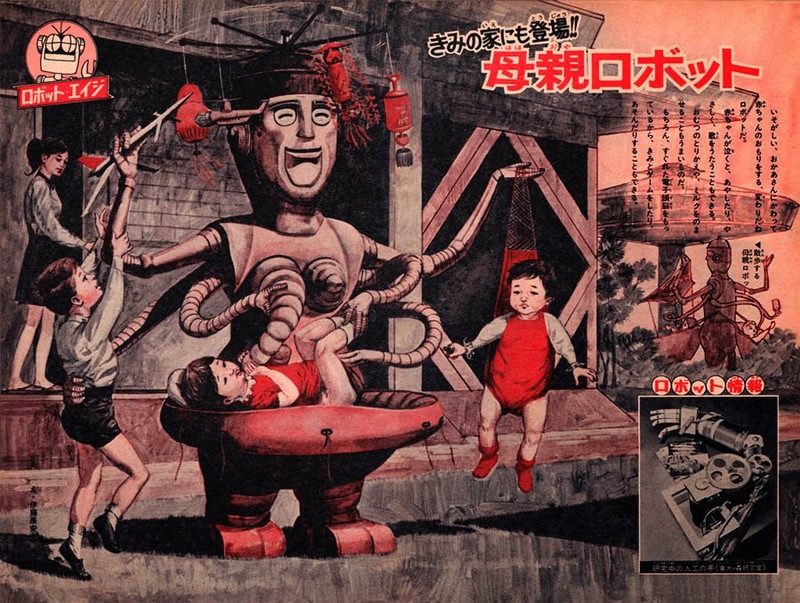 Sure, you have a crowd of abductees retelling their stories of horror aboard a ship of untraceable origin. Local authors hawk fiction and nonfiction stories of the weird and strange. And if you’re hungry, there’s always fried dough to munch on. My sister Gwen and our friends Susan and Kate (actually, they’re sisters too) gathered together to check out the festival. Having never actually attended, none of us knew what to expect, which was a good thing. 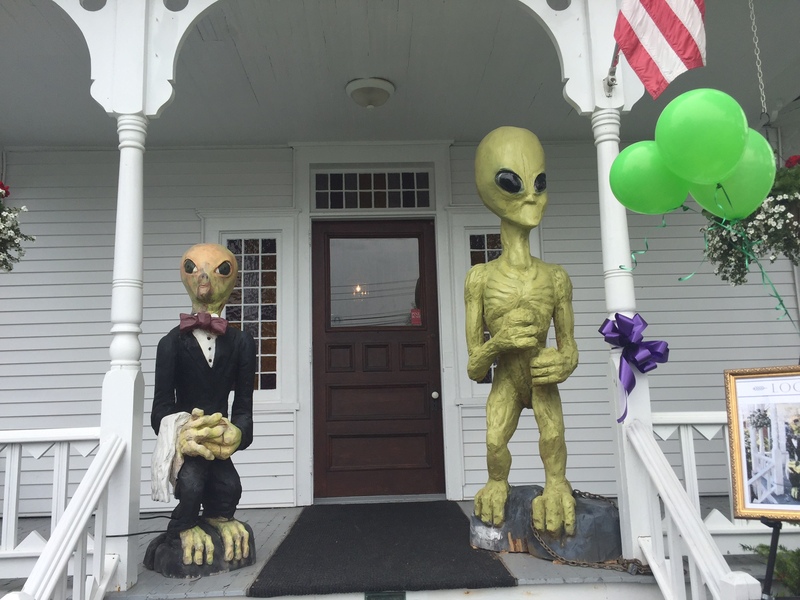 Yeah, sure, alien stereotypes abound. Oh, so what. Who cares? The whole town’s having a great time, a silly laugh and an excuse to dress up. What’s wrong with that? 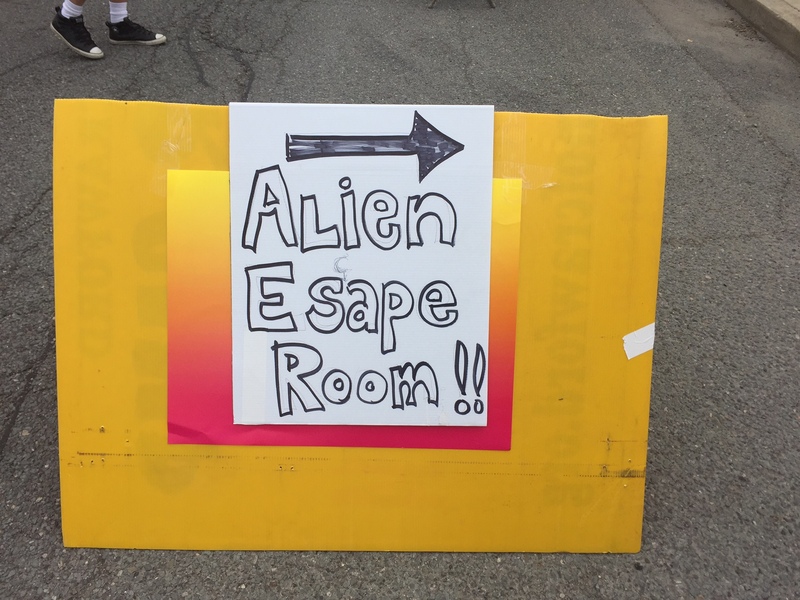 If things got too much, aliens can always esape…or escape…to a special hideaway created just for them. 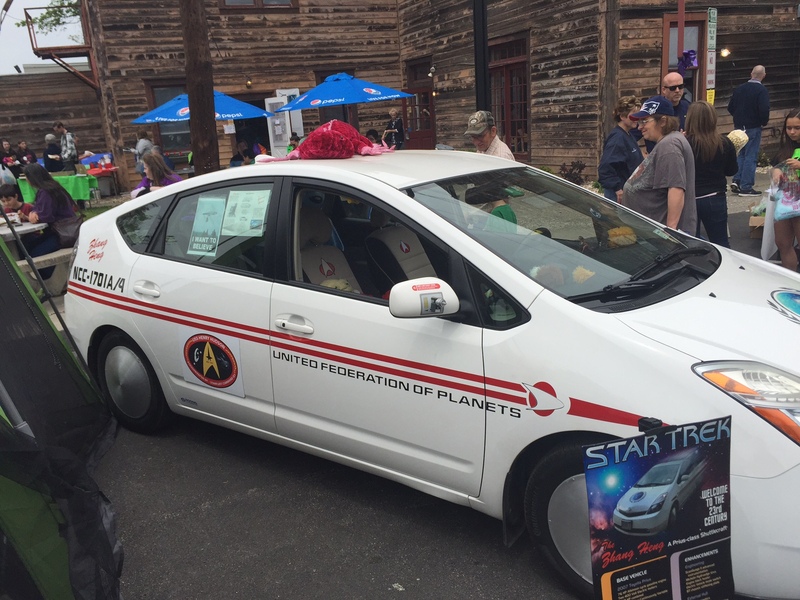 To break of the monotony of green, we’ve got a little Star Trek thrown in. 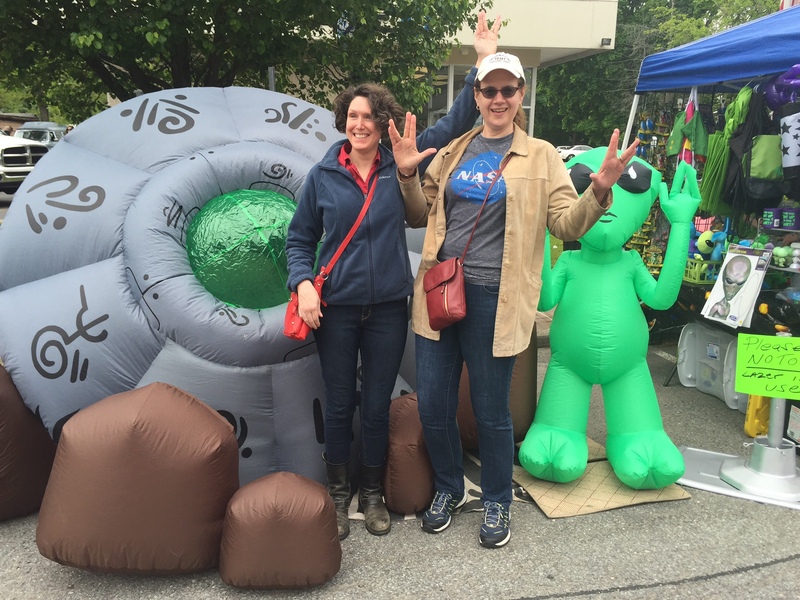 As Gwen and I wandered around, we came upon these two from the local chapter of the Star Trek Fan Club from Poughkeepsie, NY. 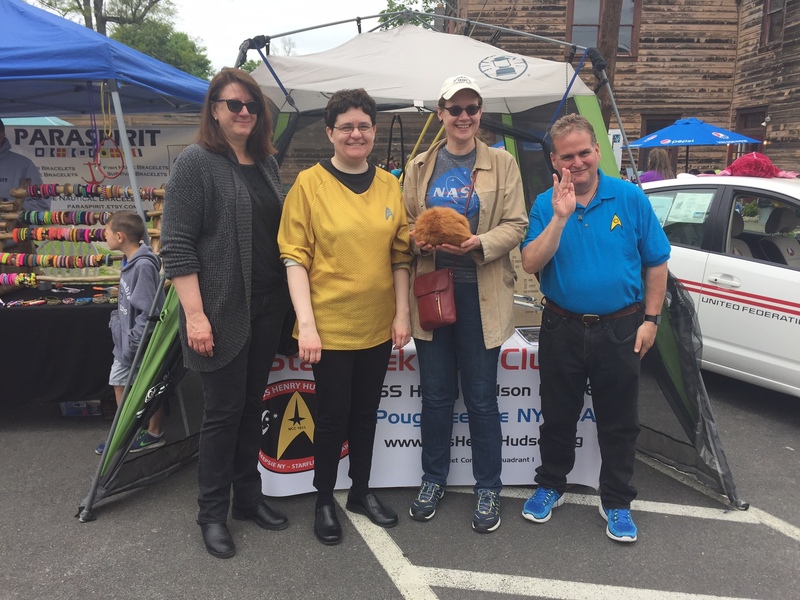 These two reps from the club were about as enthusiastic as can be, offering me a chance to snuggle the tribble, offer me a piece of Double Bubble, and graciously giving me a copy of their newsletter. They’re open to new members and have MeetUps often. Visit their website for more details, if you’re interested. Of course, any festival has great souvenirs of all kinds. 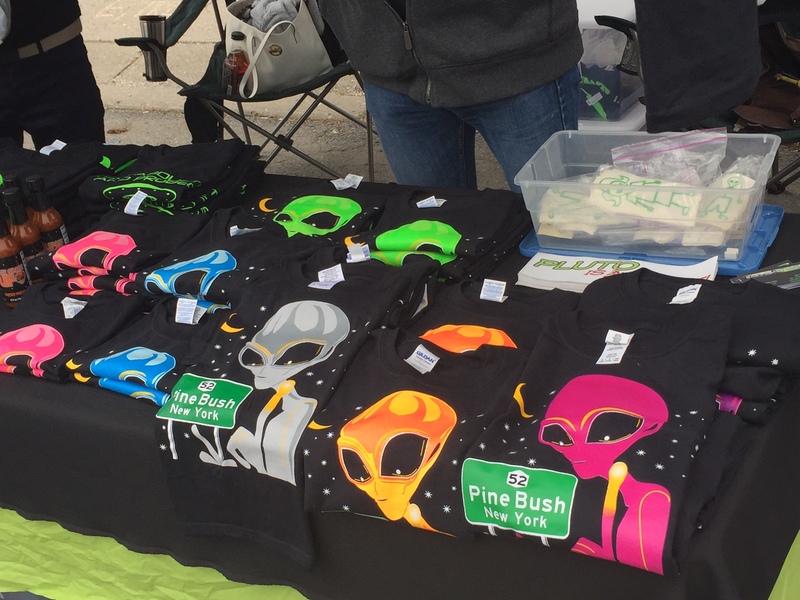 Everyone seemed to be selling T-shirts and although I really thought they were cool, $20.00 is a bit steep. 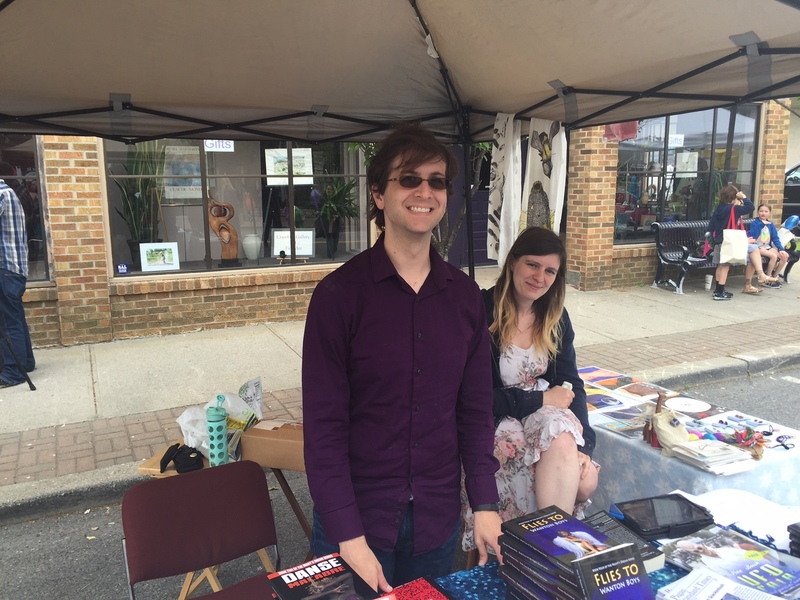 Thomas Quackenbush, a local sci-fi author, sold his books. And what kind of festival is it if there isn’t some kind of ear-splitting music echoing down the streets? 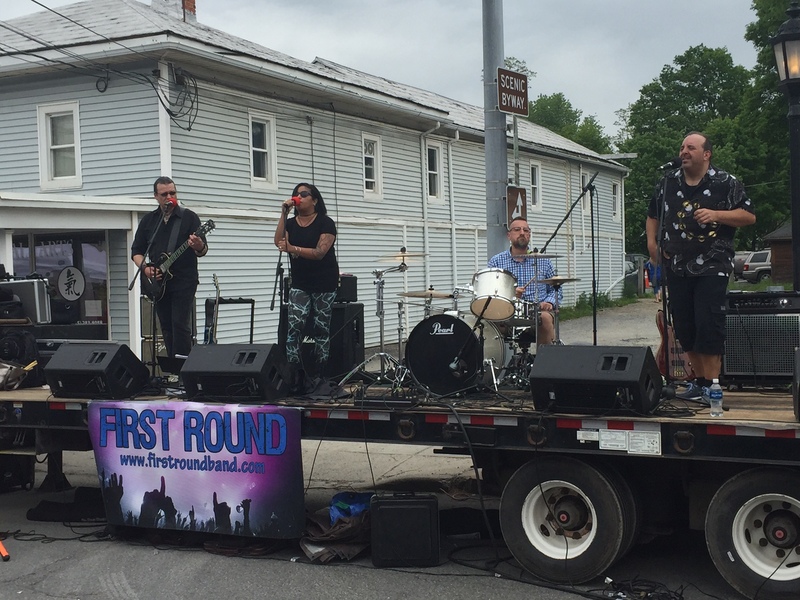 This particular band, First Round, actually was quite good. They played a good selection of covers extremely well. I liked them. Down the other end of the street, however, was a high school band with a horribly off-key wailer, accompanied by kids playing their instruments without any discernible rhythm. 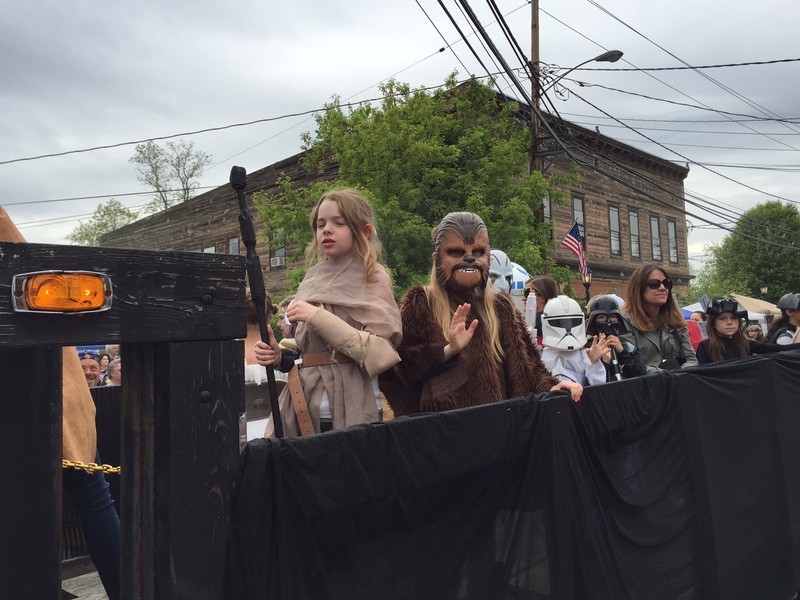 I’m saving the best for last – the parade. The Parade. Sure, it’s tiny and if you blink, it’s over. But man, those streets jam up and everyone cheers ’em on! 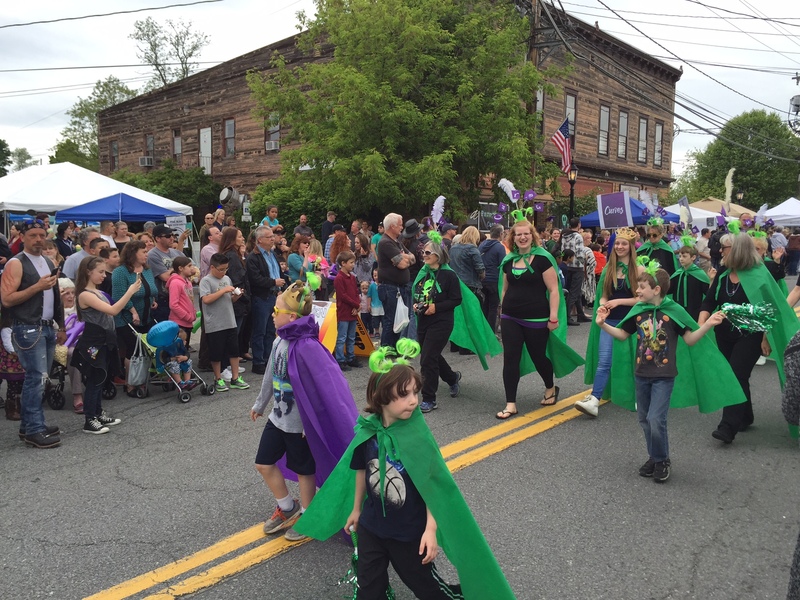 As you can see by the above pictures, the parade was well attended. Alas, the day came too quickly to a close, so we ran for the car, seven blocks away, and drove off before everyone else thought about leaving. On our way home, as we got diverted down a road none of us ever saw because of an accident, we recounted our adventure on a lovely Saturday afternoon. Already we’ve made plans for next year. Oh, and it’s been decided: we’re going as Coneheads. What mother doesn’t enjoy a wonderful surprise on Mother’s Day? And with today’s fluid definition of genders, mothers come in all shapes and sizes. So here’s my brief tribute to what motherhood might mean, in modernspeak. While our friend Captain James T. Kirk certainly wasn’t what I’d consider a motherly figure, he sure knew his way around reproduction, given the amount of female alien types he seemed to pick up and hit on. 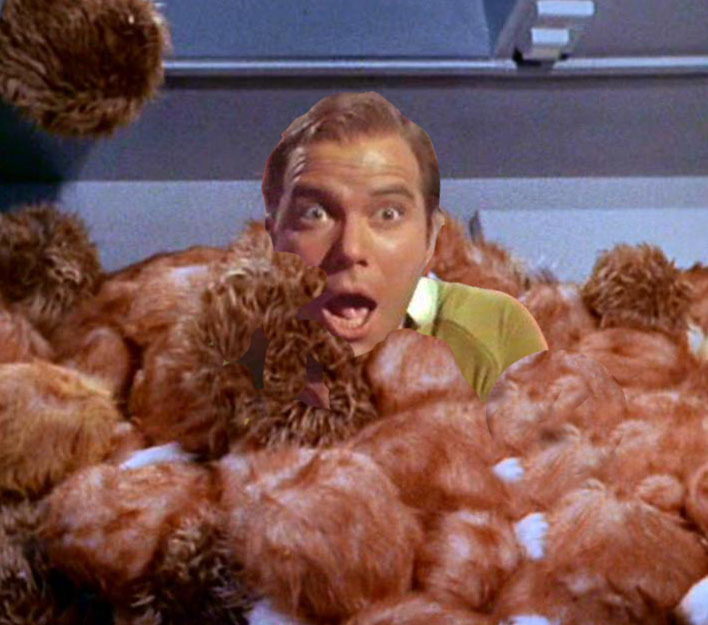 So it’s completely fitting that he’s burdened with a whole piles of lovable, adorable tribbles, who seemed to have taken a real shine to him. They kind of popped up all over the place in the space ship, giving rabbits a run for the money. Since Kirk was in charge of the ship, he fostered an environment for motherhood, since these things were determined to have been born pregnant. How about Lou Gosset, Jr. playing a reptilian Jeriba, of the Drac people, an asexual race. Jerboa gave birth and then died, leaving an alien (to Jeriba, at least) Willis Davidge (a.k.a Dennis Quaid) to raise him. It’s not the best way to parent a child, but that’s why Dennis/Willis showed up, so at least the kid had a role model of sorts. 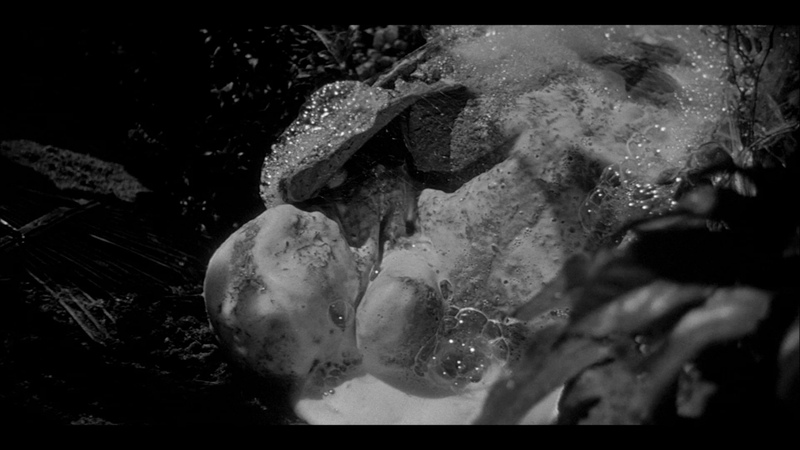 Here’s the completely parent-less delivery method called Body Snatching. It’s important to remember that these aren’t zombies, or the undead, or whatever. These life forms are a likeness, a substation, a stand in, much like margarine stands in for butter on occasion. Sure, it tastes all right, but it’s not butter, but it does what it’s supposed to do, so what difference does it make? And while anyone who’s fallen victim to the body snatchers can’t distinguish the difference between their original selves and the new-and-improved version, why should you, as a child, complain? After all, these new bodies just might believe all those half-baked lies you deliver when you want to stay out with your friends way past your bedtime on a Saturday night? So folks, I surely hope you treated your moms right, bought flowers, dinner, cards, called, paid tribute, genuflected, thanked from the bottom of your heart and pledged to be the perfect child from today on forward. One day, Mom won’t be around to tell you what to do, and believe me, as one who knows, you’ll miss her like you can’t image. Here’s to Mom…in whatever shape or form, on Mother’s Day. So what’s a small town to do? Run? Hide? Deny it? Of course not! 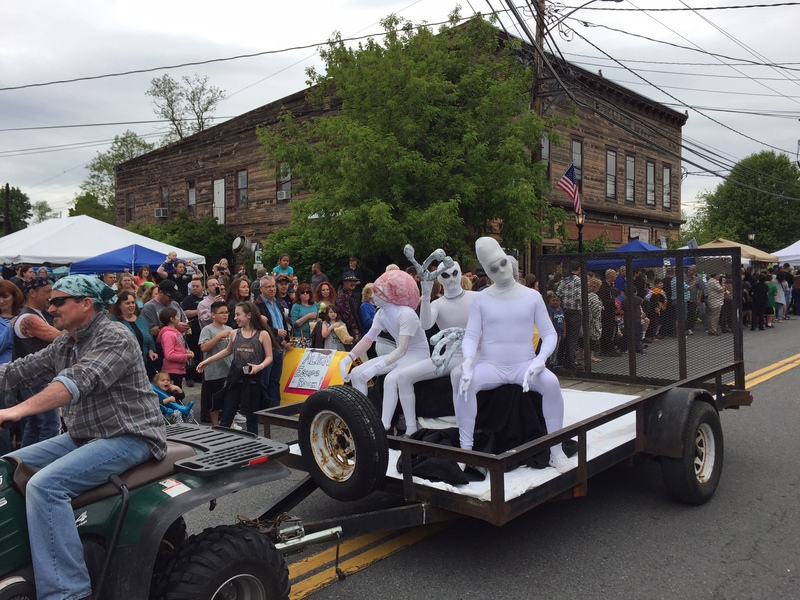 People of Pine Bush are a celebratory folk, enjoying and capitalizing on their claim to fame. 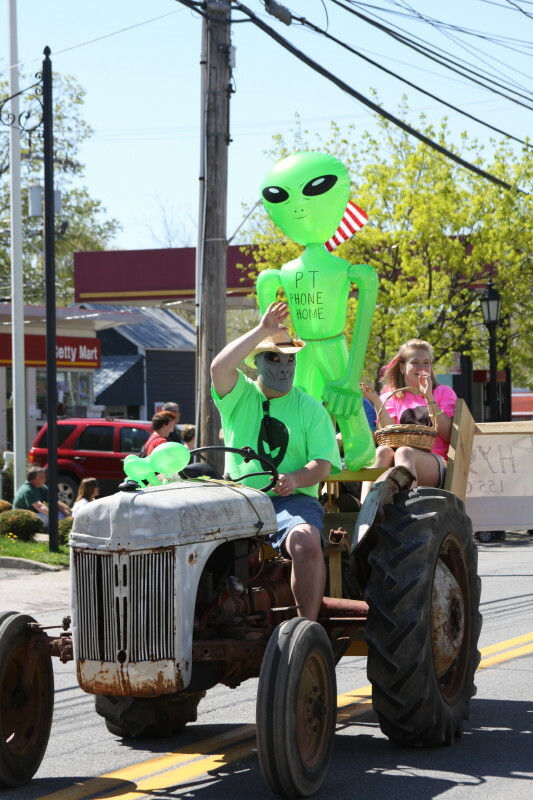 And to that end, each year it hosts its annual UFO Fair, always held in the spring. Its citizen rejoice in this opportunity to share with this world its particular attraction for tourists from other worlds. 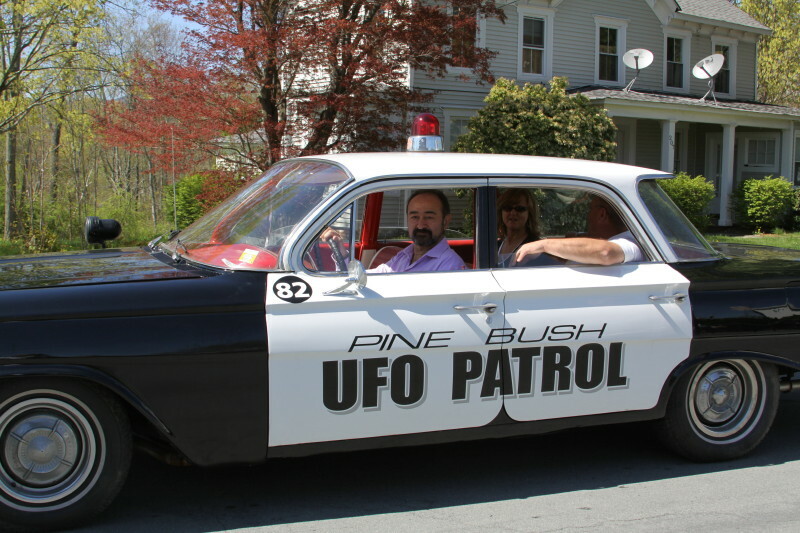 Though activity of some sort always seems to be present in Pine Bush, the 1980s and 1990s turned out to be a particularly active time. Those were the years of the “Westchester Boomerang,” a UFO seen with great regularity across the Hudson River in Westchester County, but also in Pine Bush, too. Red mists rose from fields. Strange lights slinked, darted, zipped and hovered through woods, marshes and farmers’ fields. 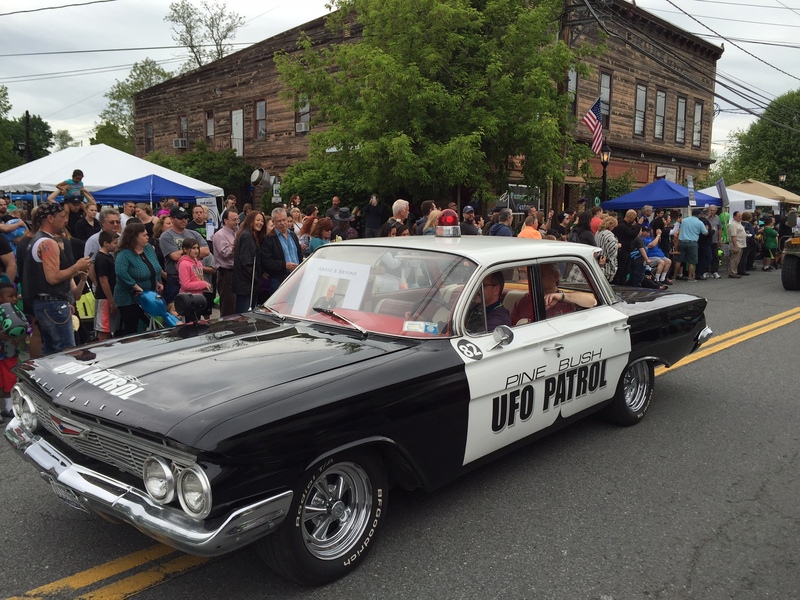 Now, there’s lots of naysayers who’ll state that UFOs in the area are merely mistaken aircraft flying over from nearby Stewart Airport/AFB, West Point, or planes approaching from others such as Newark Liberty or LaGuardia. Talk to the locals, though, and they’ll tell you otherwise. They know what airplanes look like. Those unidentified crafts flying above their heads aren’t the result of an active imagination after a few too many beers. Not everything in this world can be explained easily, if at all. As the saying goes: if you can’t beat ’em, join ’em. 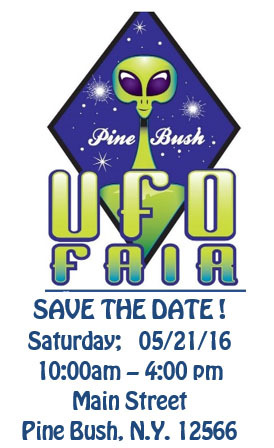 Pine Bush has been welcoming its offworld friends for many years, and welcomes you too. Come, meet the locals, shop in their stores, eat at the Cup and Saucer Diner, and support this wonderful festival filled with good times, happy memories, games, informal talks, entertainment AND a parade! I’ve been glancing through the headlines, as most of you do, I’m sure, to not only figure out what’s going on in this world but perhaps troll up some fodder for fiction. When I’m stuck or need a break, I put down the project at hand, pick this up and scan headlines. Not blogs or other social media, but that quaint little collection of light grey pages that lands at the end of a driveway or plops on a porch. I subscribe to two local papers, have several digital subscriptions and read all sorts of magazines, both online and print. Listen to a whole bunch of different podcasts. From these sources, a virtual (literally) treasure trove of really neat stuff’s just waiting to be picked and eaten, occasionally alive. 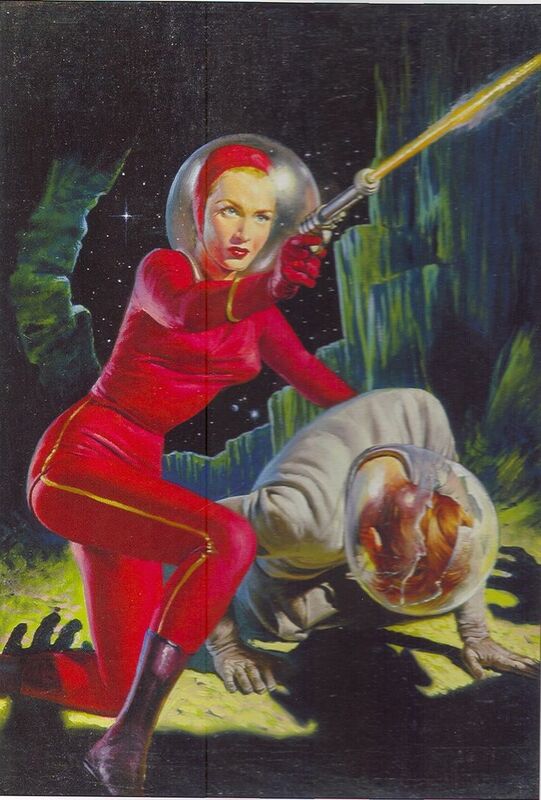 Though you might already know the stories and the sources, it’s worth consideration for sci-fi stories. Headline: El Nino May Bring Record Heat, and Rain for California, New York Times, August 13 2015 edition. Random inspiration: El Nino (“the child” – male), a slumbering pre-conquistedor kid, awakes from his long-forgotten grave when San Diego sewer workers open up a bit of the freeway to repair a broken water main. See, this kid’s the ancient victim of a sacred ritual wherein young innocents’ lives were sacrificed to The Holy One in order to bring warmth and water for crops to grow. Trouble is, after one long, lingering look at his hot wet-nurse, this youngster planned to grow to adulthood. Kid’s last thoughts, right before his neck slicing, conjured up a curse, promising a time when his bones are discovered, he’ll unleash his vengeance and both fry and flood California. So when our unsuspecting sewer workers jackhammer and pickax the asphalt on a typical July morning, the steam rising from the broken pipe isn’t evidence of a pipe failure, it’s EL NINO manifesting a physical form so he can wreaked havoc with the weather…and unite with the one woman who’d give him what he needed. Random inspiration: Though they might appear to be missing Japanese climbers, they are, in fact, only the remains of higher ascended beings who shed their disguises after studying the lives of those on Earth. Meeting at the foot of the Matterhorn glacier, their intergalactic stellercaster ship gracefully landed when said mountain, enveloped in dense fog, provided a safe and mysterious curtain for rescue. Once aboard, duo relates horrific story of nuclear war, cold war, resource depletion and disintegrating moral values, especially those having to do with free love. 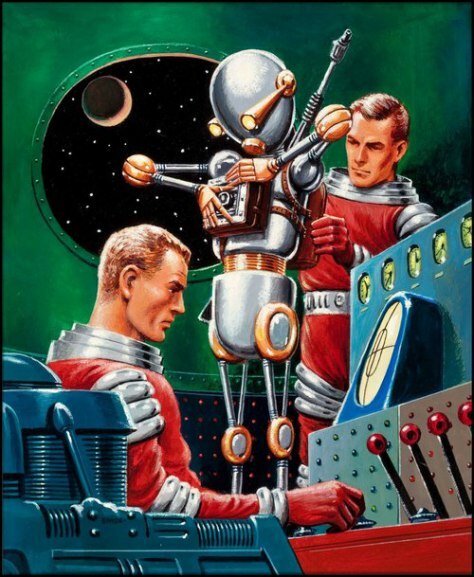 Ignoring all of the former and attentive to only the latter observation, lonely shipmates ditch the spacecraft to come ashore on this wild planet to learn a few firsthand lessons of their own. So you see? 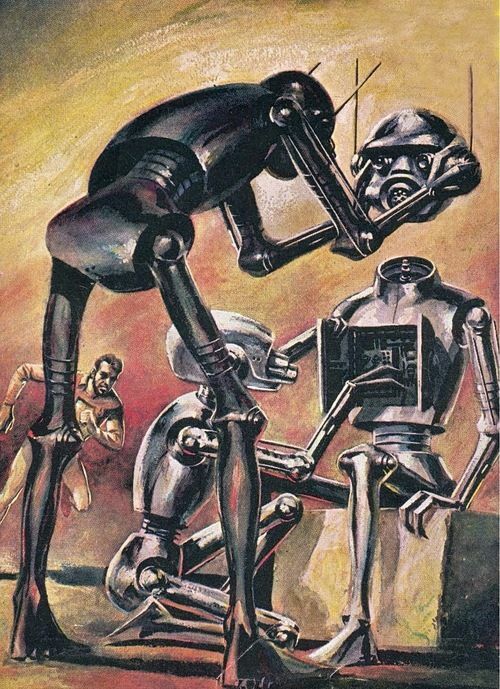 It’s not much of a leap from reality to sci-fi. All that’s needed is a quick read between the lines and a spin on the details. After all, it’s what politicians do every day. Why not you?